8 Buzz-Worthy Products: Check out a fire-retardant paint additive for drywall or wood. Read about a line of coatings that is now formaldehyde free. And browse multiple cleaners for a range of jobs. It’s all in Product Watch. 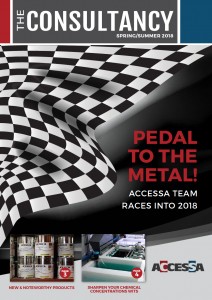 Accessa’s 2018 to Date: We’re working to keep happy customers, meet product demand, and respond to urgency. Accessa’s Joe Todd covers these topics and May in Indy — the fastest month of the year.